As beer lovers from around the country gather in Denver to celebrate the Great American Beer Festival, we thought we would give these visitors a taste of our great state. Throughout the summer, ten Colorado breweries have taken nature walks, hikes, and spent time outdoors as part of the Beers Made By Walking program. Along the trail they identified edible and medicinal plants and used them as ingredients in special beers. Some of the hikes were public, and fans of the brewery tagged along and helped give input. Each beer in this series is innovative in that the beers become drinkable landscape portraits of areas throughout Colorado. You'll get to taste a portrait of the Animas River in Durango, the Palmer Lake Reservoir Trail south of Denver, a beer inspired by the canyon walls of the Eldorado Creek, and many others. If you haven't made it out one of the beautiful trails in Colorado, you can still experience this beautiful place through Beers Made By Walking! 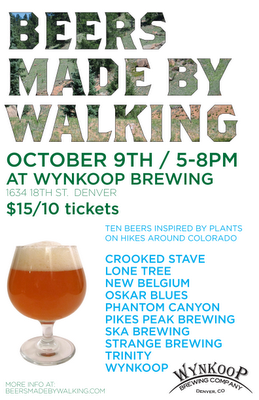 The beers will be available for one night only in Denver on October 9th, from 5-9pm, at Wynkoop Brewing (1634 18th St.). Visitors will buy tickets, ten for $15, and each ticket will provide a 4oz pour of one of the BMBW beers. Each visitor will receive a special drinking glass made for the event. The beers will be served in the upstairs bar at Wynkoop. 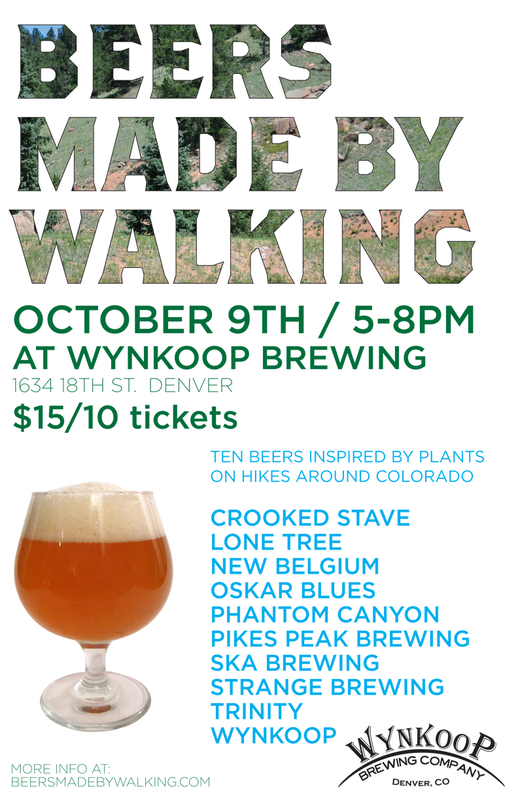 Beers Made By Walking is a program that invites brewers to make beer inspired by nature hikes and urban walks. Each walk is different, each beer is a portrait of that landscape. The program began in Colorado Springs in 2011 with the hopes of inspiring others, through beer, to look at our local landscapes in fresh and community-minded ways. Since then it has expanded into multiple cities/states including Colorado, Oregon, and Washington. Please see beersmadebywalking.com for more information.